The Perfect Elements crew brings us a good look behind-the-scenes of the recent Russian YoYoing Competition held in Moscow last weekend. Check out some burly play from the hangout room of the contest! World Counterweight YoYo Champion Takeshi Matsuura has entered the second stage of his competition career as an incredible 1A player, and this new video from Perfect Elements really showcases his fantastic 1A tricks and construction. 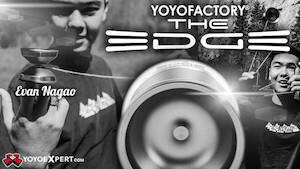 Yoyo used is the Palpitation by Turning Point. Russia’s Perfect Elements crew have teamed up again with Turning Point for a new video, and the results are mind-blowing. There is so much talent crammed into this video! Featuring Jano Meboniya, Victor Gravitsky, Igor Galiev, Kentaro Kimura, and Igor Vishnyakov. Yoyos used are the Houska and Isotope 2 by Turning Point. New concepts video from Igor Galiev and Andrey Glukhov. I really enjoy listening to players that I don’t know discussing what they are doing…it’s as much of an insight into their creative process as the tricks themselves.